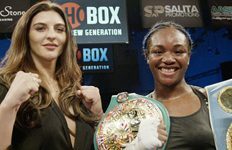 Browse: Home / 2019 / April / 14 / IBF & WBA World Champion Claressa “T-Rex” Shields Defeated WBO World Champion Christina Hammer in Atlantic City! At the Boardwalk Hall, in Atlantic City, NJ, Saturday night on ShoBox Salita Promotions (Dmitriy Salita) and King’s Promotions (Marshall Kauffman), Matchmaker Lina Kurylyuk, promoted a unified World Middleweight Main Event between 2-Time Olympic Gold Medalist, IBF & WBA World Champion Claressa “T-Rex” Shields and WBO World champion Christina Hammer, of KAZ, and Dortmund, GER. In the first round Hammer landed a double jab and got countered with a Shields right all on the chin. Hammer continued to use the jab while Shields ended the round with a right to the chin. In the second round Shields landed a left hook to the chin. In a clinch shields hit Hammer behind the head without a warning from Referee Sparkle Lee. Shields hurt Hammer with an overhand right to the chin in the last minute of the round. In the third round Hammer kept scoring with the jab and an occasional right to the chin. Shields with both arms to the side was not very active though coming forward. In the fourth round Shields landed a right to the chin and seconds later landed a left hook on the chin. Referee Lee continues to warn Hammer not Shields to the delight of the partial crowd for Shields. 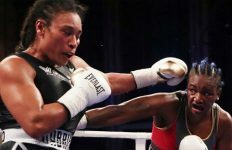 In the fifth round Shields was getting her right in on several occasions getting past the Hammer jab. In the sixth round Shields was able to get the right in as she followed Hammer around the ring. In the seventh round it was Hammer inside landing short rights to the chin. Hammer landed a solid right having Shields against the ropes. Referee Lee keeps warning Hammer in the clinches but never Shields. In the eighth round Hammer landed a counter right on the chin of Shields. Shields came back with a flurry of punches. Hammer’s mouthpiece went out and it took 30 seconds after Hammer told Referee Lee before she would replace it. Shields landed a flurry of punches having Hammer in her own corner. In the ninth round Shields turned southpaw and back to orthodox that fast scoring with a left hook to the chin of Hammer. Just prior to the bell Hammer landed a left hook to the chin of Shields. In the tenth and final round Shields used a triple jab and followed up with rights. Hammer knew she was behind but didn’t seem to go all out allowing Shields to get the best of her inside. Scores were 98-92 as did this writer. “First I want to thank God. Hammer can fight,” said Shields. 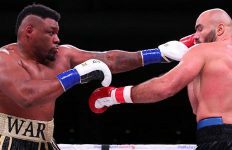 In the co-feature Heavyweight Franklin, 18-0 (13), of Saginaw, MI, defeated “Rockin” Rydell Booker, 25-2 (12), of Detroit, MI, over 10 rounds. In the first round the fans were up for some action after a delay. Booker in the last ten seconds got the fans shouting when he landed a double left hook to the head of Franklin. In the second round Franklin opened up with a right hand to the chin of Booker. A right from Franklin at the bell got the fans excited. Two Michigan fighters fighting in Atlantic City. State title fight? In the third round Booker showed some defensive skills making Franklin miss while in close. Booker with his back against the corner landed a hard right uppercut to the chin of Franklin. In the fourth round Franklin drove Booker into the ropes with a combination. Franklin had Booker backing into the ropes and got countered with a Booker left hook to the chin. In the sixth round of a close fight Booker seemed to be slowing down as he got hit with a Franklin left hook on the chin, but is still slipping punches. In the seventh round both fighters opened up having the fans on their feet. Booker ended the round with a left hook to the chin of Franklin. In the eighth round Franklin drove Booker against the ropes with a solid right to the chin. Seconds later it was Booker landing a right on the chin of Franklin. In the ninth round Franklin landed a solid lead right to the chin of Booker who had spent the second half of the fight against the ropes. Franklin landed a right and got countered from a Booker right both on the chin at the bell. In the tenth and final round both fighters gave their all with not a lot left in either. Scores were Kinney 99-91, Grant and Rubenstein had it 98-92. This writer had it 97-93. Featherweight Elena Gradinar, 9-1 (2), of St. Petersburg, RUS, lost to Brenda Karen “La Pamita” Carabajal, 16-4-1 (9), of San Salvador de Jujuy, ARG, for the vacant IBF Featherweight title over 10 rounds. 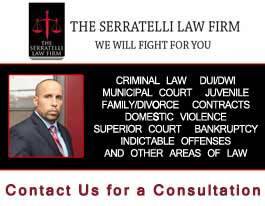 In the first two rounds they fought on even terms with Gradinar switching from southpaw to orthodox. In the third through fifth rounds Carabajal held a slim lead. In the seventh round Carabajal rocked Gradinar with a right to the chin. In the eighth round Carabajal landed a solid left hook to the chin getting Gradinar’s attention. In the tenth and final round Carabajal seemed to win the fight easily. Gradinar was taken to the hospital on her own volition. Scores were Barnes and McNair 97-93 while Layton had it 96-94 while this writer had it 97-93. Heavyweight WBA & IBF No. 5 ranked southpaw Otto Wallin, 20-0 (13), of Sundsvall, SW, and “Slick” Nick Kisner, 21-4-1 (6), of Baltimore, MD, ended in a No Contest after one round. In the first round Kisner was cut over the right eye. Wallin got tired of the clinching and tossed Kisner across the ring into the ropes. The ring physician didn’t allow Kisner to come out for the second round. 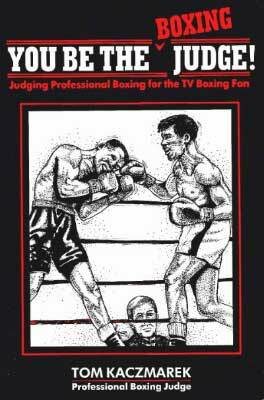 Super Bantamweight southpaw Jesse Angel Hernandez, 12-3 (7), of Ft. Worth, TX, couldn’t come out for the fourth of a scheduled six losing to Marcus “Dream Crusher” Bates, 9-1-1 (8), of D.C. In the first round both boxers mixed it up pretty good. In the last minute of the round Bates landed a solid right to the chin getting Hernandez’s attention. The latter then chased down Bates up to the bell. In the third round Hernandez continues to switch from orthodox to southpaw. The shorter Bates has the quicker feet and hands getting in counters punches. In between rounds the Hernandez corner wouldn’t allow their boxer to continue. Hernandez told this writer “an old cut on the eyebrow opened up again”. Super Flyweight Jarico O’Quinn, 12-0-1 (8), of Detroit, MI, defeated Mexico’s Vicente Alfaro Martinez, 9-5 (3), of Northfield, MN, over 8 rounds. In the first two rounds the taller O’Quinn used a good jab. From the third round through the fourth little has changed with O’Quinn still getting in more punches. In the fifth round Martinez got behind O’Quinn reached around and hit him receiving a warning from Referee Brown. In the sixth round O’Quinn started switching from orthodox to southpaw again as Martinez was the aggressor. In the eighth and final round both mixed it up well with Martinez having one of his few better rounds. Scores were Grant, Kinney and Rubenstein 80-72 as this writer had it 78-74. Former WBC Heavyweight champion Samuel “Nigerian Nightmare” Peter, 37-7 (30), lost a split decision to Mario “Chabelo” Heredia, 16-6-1 (13), of Distrito Federal, MEX, over 8 rounds. In the first two rounds Peter was the aggressor knocking out the mouthpiece of Heredia in the second. Heredia landed he final punch of the round a right to the chin. In the third round Peter rocked Heredia with a right and followed with a second right dropping him for the 8 count of Referee Earl Brown. He got up and threw a right that didn’t land and fell back to the canvas. He got up and held his own until the bell. In the fourth round both fighters especially Heredia were missing more than landing. Heredia backed Peter into a corner with several rights. Later in the round Heredia again missed a wild punch and fell to the canvas. In the sixth round Peter knocked out the mouthpiece of Heredia again. In the seventh round Peter landed a right on the chin that had no effect on Heredia. Both fighters are tiring at this point of the fight. Heredia is landing as many as Peter but with less power. In the eighth and final round Peter lands several right uppercuts on the chin. Heredia landed a wild left to the head of Peter. Peter is using the old Larry Holmes trick using his left as a straight arm “lining up” his opponent. Peter a shell of his former self earned the win. Scores were Grant 77-74 Heredia, Rubenstein 79-72 Peter, Kinney 77-75 Heredia. This writer had it 77-75 Peter. 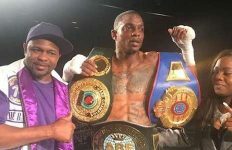 Middleweight Isiah “Zoo” Seldon, 13-2-1 (4), of Somers Point, NJ, came off the canvas in the first round to dominate Bryan Goldsby, 5-10 (0), of Macon, GA, over 6 rounds. In the first round neither fighter opened up just feeling out one another. Halfway through the round Goldsby jumped on Seldon landing a flurry of punches knocking him down in a neutral corner. Seldon got up at Referee Ricky Gonzalez count and took control landing this first punch as Goldsby came at him backing him up several steps with a right to the chin. In the second and third rounds it was all Seldon going after Goldsby when he got close enough to land something. In the fourth round Seldon continued to control until he landed a low blow. Referee Gonzalez gave him 5 minutes to re-coup. In the fifth round Seldon landed a solid left hook to the chin making Goldsby grab him. Seldon lifted him up in the air and fortunately didn’t throw him out of the ring. Seldon seemed to continue to take charge but the fight was filled with too much holding on the part of Goldsby. Scores were all 58-55 as was this writer’s score.